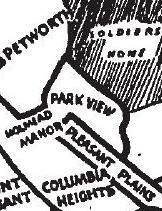 DPW | Park View, D.C. 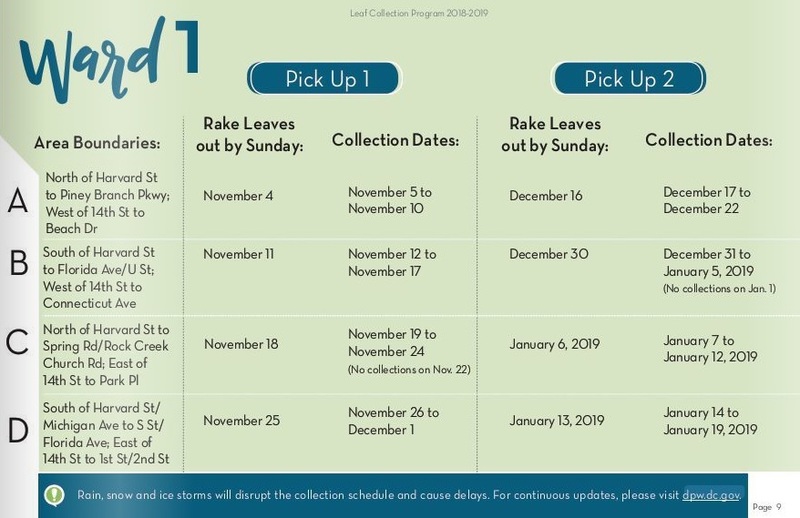 In reviewing DPW’s 2018 leaf collection guide, the first round of leaf collection in Park View will begin the week of November 19th — provided that leaves are raked into the treebox space this Sunday (Nov. 18th). 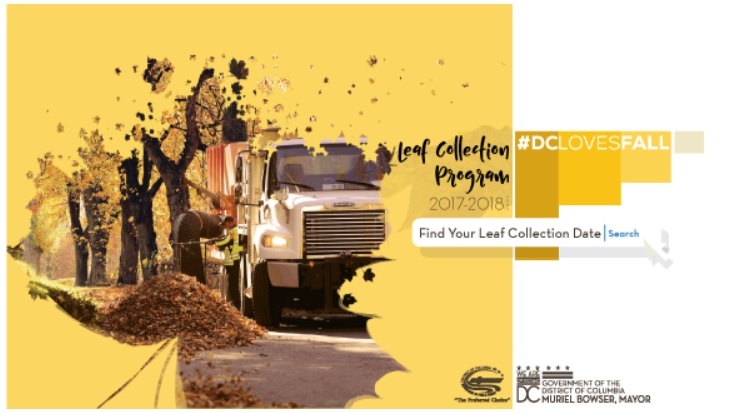 More information is available at the DPW Website and you can also track the progress of DPW’s leaf collection crews throughout the collection period. The maps and schedule below can also be useful. 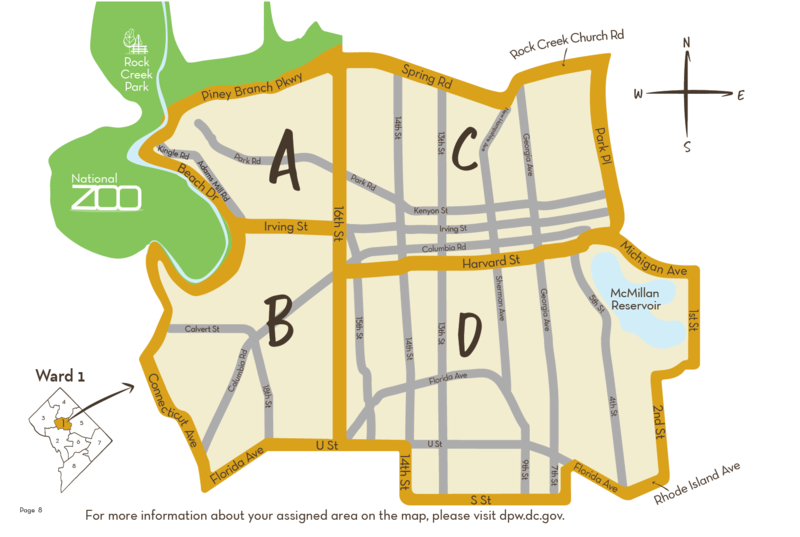 2017/2018 Leaf Collection Schedule Update: Unfortunately, our collection crews are behind schedule in some areas of the city, which has been exacerbated by recent winter weather events. Leaf collection crews are the backbone of our city’s snow program. When snow is predicted, our trucks’ leaf collection equipment is replaced with snow plows and salt spreaders, and our crews receive snow and ice removal assignments. After a storm clears, leaf crews resume collections across the District—there may be delays, but neighborhoods are never skipped. We thank you for your patience and apologize for the inconvenience. Assuming the current weather forecast holds, we expect to be back on schedule by the end of this week. 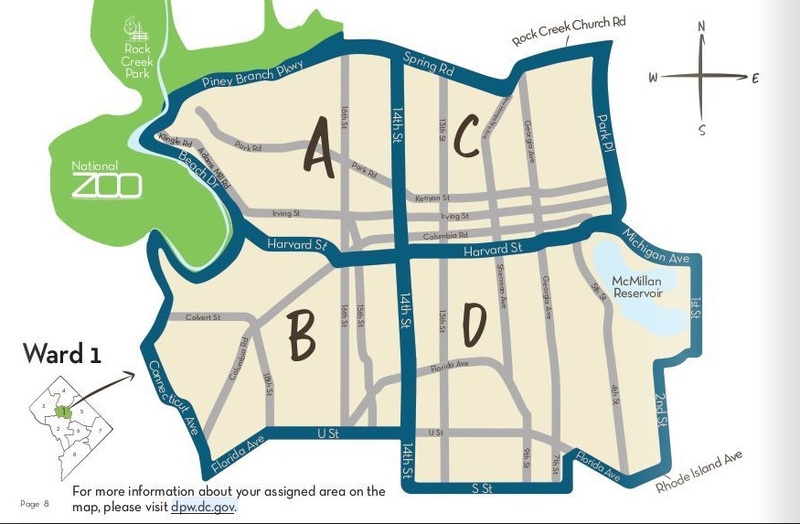 Should you have questions about the collection schedule in your neighborhood, please contact our customer service specialist Hope Cousin directly at Hope.Cousin@dc.gov. The Department of Public Works’ 2017 leaf collection schedule was mailed out last week. 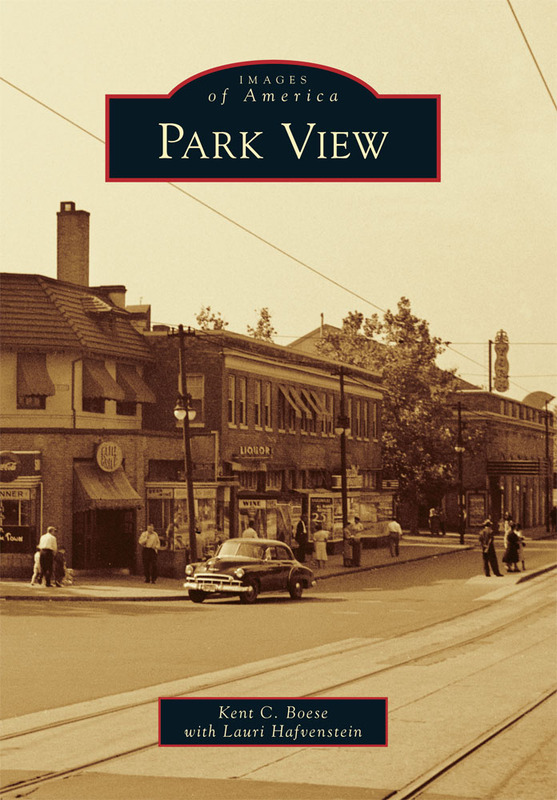 In Park View, the two dates to remember are Sunday, November 19, and Sunday, December 17. 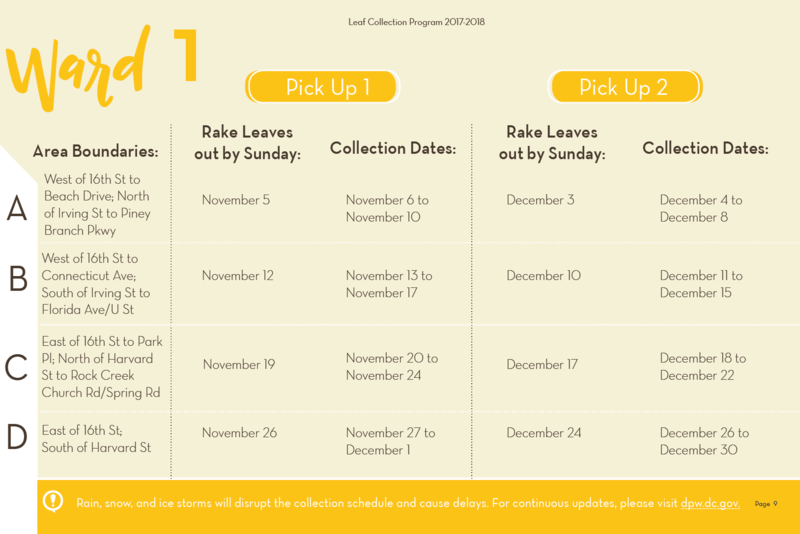 These are the dates leaves need to bagged or raked out for collection (see map and chart below). Do report clogged storm drains by calling DC Water at (202) 612-3400. Lastly, if any of your neighbors are seniors consider offering to help them to rake their leaves. A little over a week ago I posted that the Metro ventilation shafts on the east side of Georgia Avenue between Quebec Place and Rock Creek Church Road had become defacto litter cans after litter cans were removed in the winter of 2011/2012. I know that several people reached out to the Department of Public Works (DPW) in addition to myself, and it looks like that activism has done its job. In walking down the 3660 block of Georgia Avenue yesterday I noticed that DPW has installed not one, not two, but three new litter cans on the block. There is one in the center of the block, one outside of King’s Deli, and one outside of Georgia Beauty Supply. 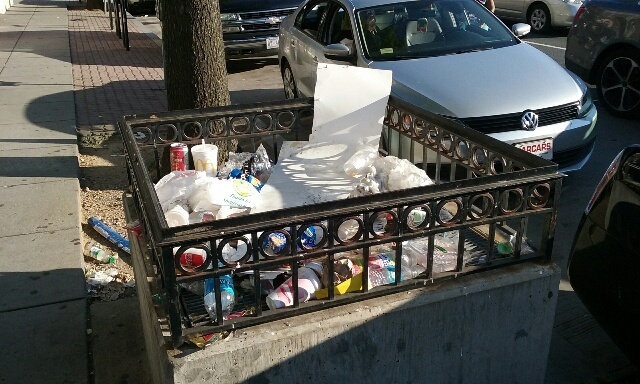 Photo of Metro ventilation grate full of trash, sent in by a reader. Lately, the east side of Georgia Avenue between Rock Creek Church Road and Quebec Place has been particularly bad with discarded trash. 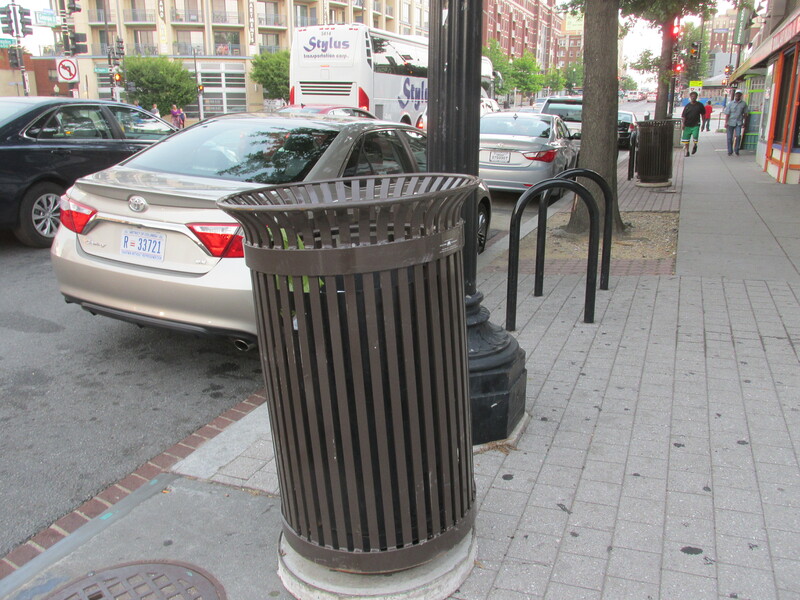 In particular, the two ventilation grates for the nearby Georgia Avenue metro station have been used as de facto trash collection bins as shown in the photo taken on July 11th and shared by a reader. Several neighbors have reached out to me, DPW, and Councilmember Nadeau seeking a solution to this problem. In addition to a Green Team which would come later in the year, one suggestion has been to have a new litter can added to the block so that people have some place to put their cups, bags, and other debris. 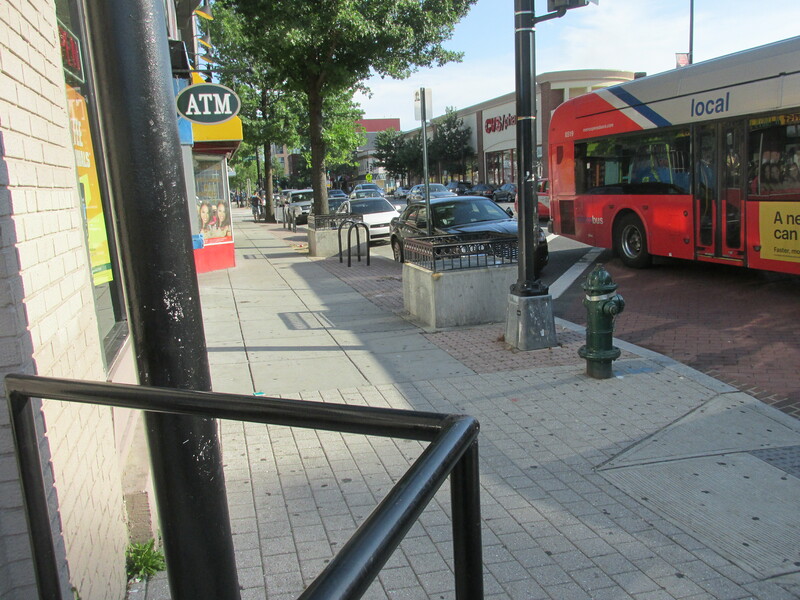 There used to be a litter can on this block which was removed sometime between October 2011 and May 2012. 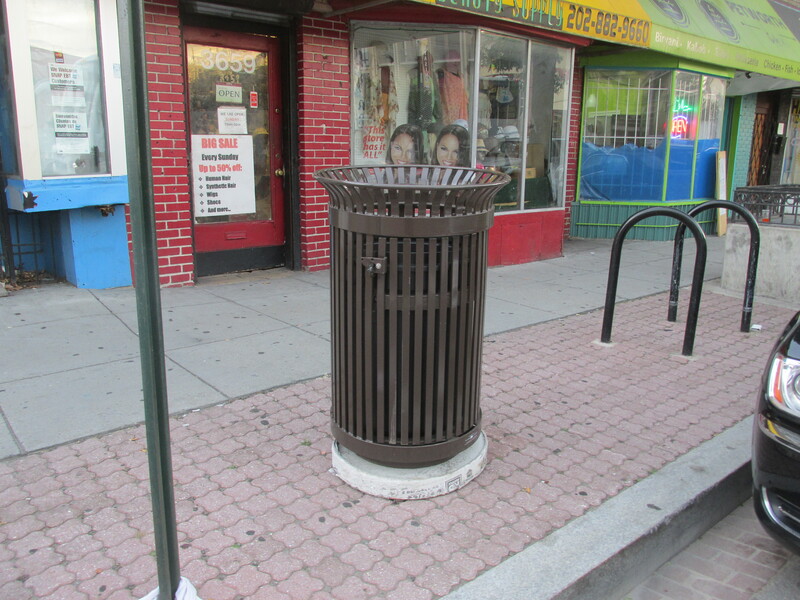 As the ventilation grates are being used as litter cans, and as Georgia Avenue is a heavily used commercial corridor, it makes sense that the litter can should be returned. Requests have already been made to the Department of Public Works for a new can and we hope to see it installed soon. 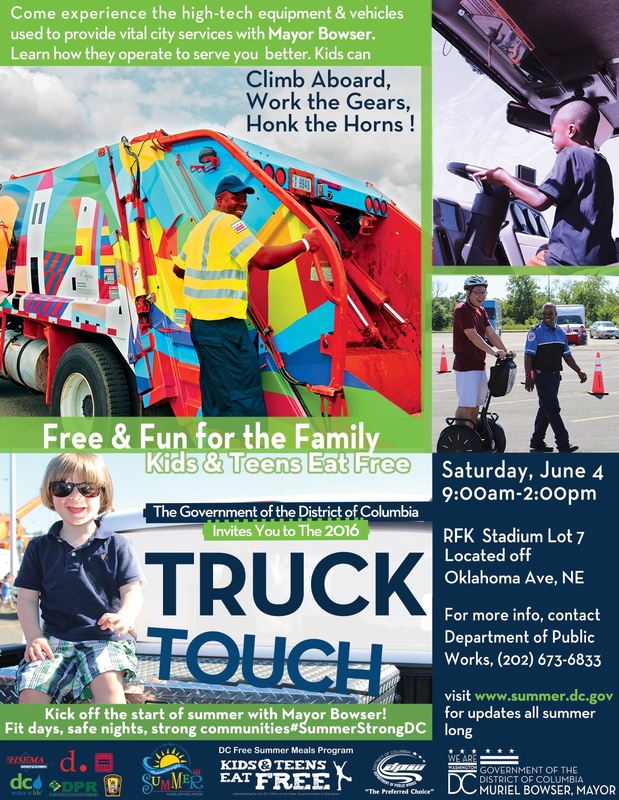 DC’s 9th annual Truck Touch event is scheduled for Saturday, June 4, 2016, at RFK Stadium – Lot 7! The Department of Public Works and Mayor Bowser have scheduled a day of food, fun, games, trucks and more! In asking around, I’ve learned that the annual Truck Touch has been a popular event in the past. I’ve included the flyer below for more details. 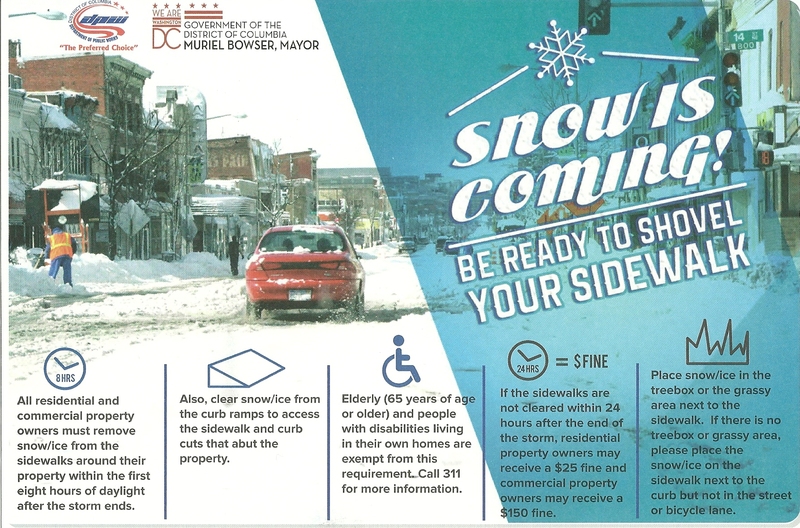 The mailer outlines that all property owners are responsible for clearing snow and ice from sidewalks and ramps within 24hrs after the end of a storm. If they do not, they may receive either a $25 (residents) or a $150 (commercial) fine. The elderly and people with disabilities living in their own homes are exempt from this requirement (sidewalk exemption form here). You can also read the full winter safety rules here.